Ikan Bilis What?? | Ipoh Mali Talak Sombong! This entry was posted in Culinary Experiments by Jason. Bookmark the permalink. oh, i seriously in love with this. my mum used to cook with sweet and fresh onion, ikan bilis and dried chillies. simple yet delicious! mum cooked ikanbilis with peanuts, and sugar. perfect with rice, porridge, or as snacks. This can make 1 big batch & keep refrigerated, right? So when can I come over with a container? Haha, then it’s ikan bilis cili! Not sure about kept it refrigerated as we finished it in less than 10 minutes! Can cook a bit to “tipu makan”. Hehe.. yeah, please do try to cook it and let me know if there’s anything I can improve on it. 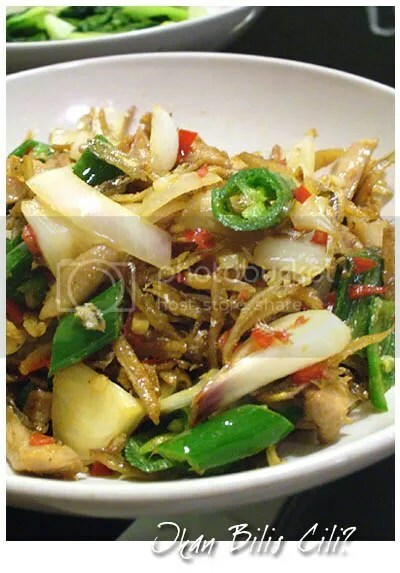 its called tumis jawa 🙂 granda make this all the time….but since I am a muslim…none porky version…. Try adding in a little belacan….you can actually add in like petola and egg plant…. Expensive dish due to cost of high quality anchovies but very delicious! Thanks for the info on the name. Tumis Jawa… sounds not bad. I bit of belacan sure will add more flavour to the dish. Thanks again! Try to get the uncleaned anchovies. Pre-cleaned ones usually costs more. ohh.. salivating thinkin of the tangy, piquant and spicy flavours all rolled into one! Wallllau weiii!!! ikan bilis and chillies are such perfect match! I love it!! Ikan Bilis Luscious Lips!! Wahh..it would be nice to have it with a hot hot hot bowl of porridge. Very very cold now lerr. I’m feeling like cooking that again. Hehe. Ikan Bilis Luscious Lips! LOL!! Good name, maybe I should call it that! Looks really interesting. How come so many of you have had this dish at home before, but not I? Will try to cook it. Hey, at least it looks almost the same! Hello. Maybe this dish is not popular in KL? Please try it! Try cooking as normal but add a dash of limau kasturi (kat zai) juice will also add the kick to the ikan bilis…tried that before. Add the limau only after u have dish them out on the plate, not during cooking, otherwise it will turn bitter. Really nice and very appetizing to go with rice.